Its was the first dinner meeting of King Wang So with Court lady Hae Soo and the 13th Prince Baek Ah. 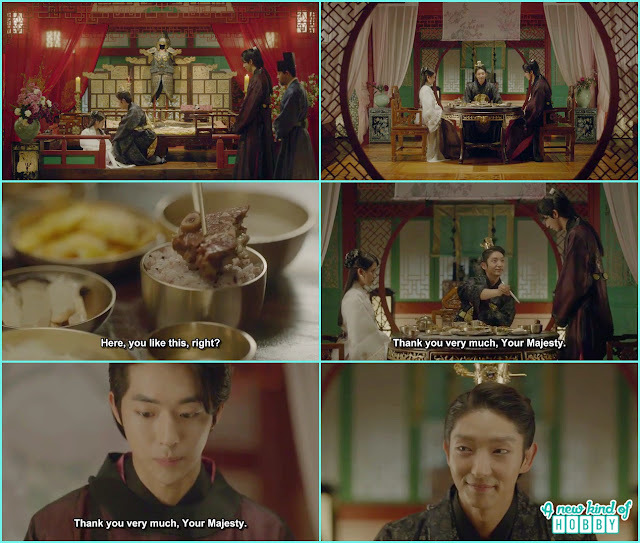 Wang So showed his poite side and served meat to Baek Ah which was unexpected for him by the King. He was surprised and get up to thank the King for it. Looking at Baek Ah change attitude and reaction we realize the throne and the owner is sure a scary one. Although it was the little brother to the king but it look like there is a big difference between the relations and the throne owner. Hae Soo wanted to tease Baek Ah and told King Wang So to keep quite. As Baek Ah was nervous he couldn't eat infront of the King so he moved his head a bit down and Hae Soo served him with fried egg. Seeing Something again served to him Baek Ah suddenly stood up and again thank to his Majesty it was the moment Hae Soo and the King Wang So laugh. Baek Ah couldn't understand what it was as he didn't knew this time it wasn't King but actually Hae Soo did it. It was an embarrasing moment for Baek Ah but become memorable moments for the three of them. They enjoyed their first meal together.